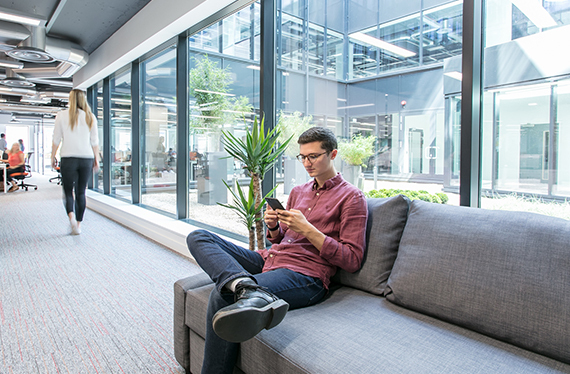 We consider some of the less expensive options and benefits of bringing natural materials, plants, lighting and nature-inspired patterns into the working environment, when it comes to enhancing productivity and well-being. Many interior designers take advantage of the positives which nature can bring by using plant- and nature-inspired patterns and tones in their work. A natural look can transform the appearance of the workplace and make a noticeable difference to employee well-being and morale. 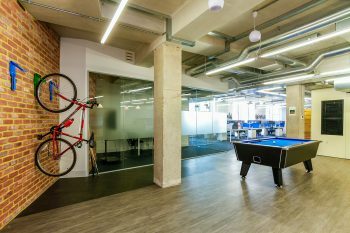 We consider a number of cost-effective measures which can make a demonstrable improvement to the employee environment, potentially resulting in reduced absenteeism, enhanced productivity and a more positive workplace morale. 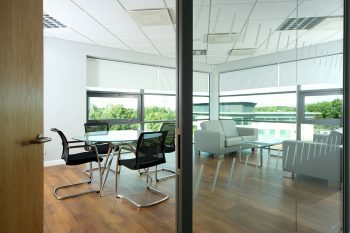 As well as it being a requirement under health and safety legislation that “where practicable” workplaces are lit using natural light, studies have shown that daylight can have a positive effect on mental health and mood. Often a considerable increase in natural light can be achieved by removing interior barriers: something as simple as replacing opaque interior screens with translucent options, for example, can make a noticeable difference to interior lighting levels without requiring radical structural change. “Natural” light bulbs can also help achieve an outdoor lighting look where there is insufficient natural light. Not only are plants aesthetically pleasing, they also have a selection of functional advantages: a well-placed plant can be an attractive yet effective privacy screen, for example. Plants can also counteract the effects of pollutants, potentially contributing to better internal air quality. Reasonably cheap to acquire, low-maintenance plants can often be managed in-house. 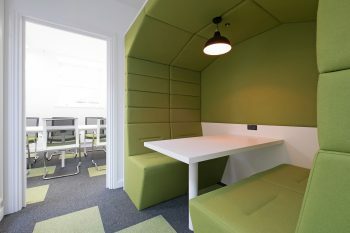 Plus, there is plenty of evidence to support the fact that plants have a positive effect on the working environment. They help reduce stress, increase productivity, reduce noise levels and improve creativity. Timber and stone look fantastic as part of an interior scheme, and there are some excellent alternative synthetic products on the market: these replicate the look and texture of stone, trees, or water, at the same time as having the durability, ease of maintenance and versatility needed to work well in an office or similar environment. Commercial flooring, that mimics nature can complement many of these interior choices, that focus on creating a more natural environment. The Duraflor Freedom Bark range, inspired by the texture of natural tree bark, is a good example of this. As well as opting for a natural colour scheme (greens, greys and browns work well), adding furniture or accessories that enhance the natural theme can also help to create the required ambiance, without a full makeover being required. With organic, natural interiors always on-trend, the time could well be right to invest in the appearance of the workplace and enjoy the difference it makes.